Here are the videos now a savegame exploit on firmware6.20 made by a Japanese developer. If you are a new member of the underground community, do not worry we will resume here the main points of why exploits. Since the arrival of new motherboards with waterproof kit SDC / XGen pandora, the only way to hack the Sony portable is … Faults. This is not new, any system has flaws and now, the goal of PSP developers is to find the flaw that will run unsigned code (as Dave chickHEN) to patch the RAM and install it Following a Custom Firmware not permanent. So the arrival of the PSP Go! (And firmware 6.20) which opened hunting faults and unfortunately many fakes dissemination. However some videos we challenge and deserve the benefit of the doubt. It’s now the turn of J416, a member of our forums and Japanese developer to show us a savegame exploit on a PSP 1000 and PSP Go! . The first video is a member of itself then the second on PSP Go! is performed by a tester:Mamosuke. 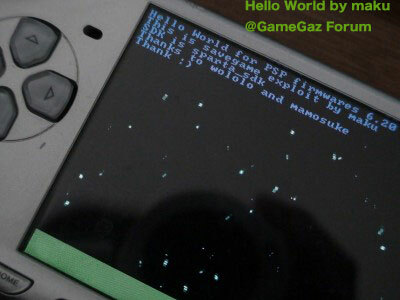 YouTube: J416 Hello World on PSP go 6.20 – His exploit is working! In summary, there is no access to the kernel and of course e-loader must necessarily be based on a kernel vulnerability. We invite developers have found such a flaw in the firmware 6.20 to Contact J416 for this leading … If this is possible. Shall there be a HEN with this feat?